Welcome to our winter wellness class! We are so glad that you have joined us! In this class, we will be teaching you how to get ready for winter! Each of our posts will inform you of different Young Living products that will help support you and your family during the “icky” season. Thieves! Is it one of your favorite oils? I bet you love it! But, do you know WHY you love it? The next few posts will center around one of our favorite oily classics-Thieves oil blend. First of all, let’s talk about its background. The story began in the 15th century when a group of bandits decided that it would be a GREAT idea to rob the dead and dying. But, they didn’t want to get sick so they coated themselves with a blend of herbs to support their immune system. When they were arrested, the police asked them for their “secret formula” in exchange for a lesser sentence. Our beloved oil, Thieves, contains similar ingredients as the formula that the infamous bandits used so long ago. Today, we use this oil for a similar purpose-to support our immune systems. Also, we love to use it to keep our homes clean and purified. Plus, it doesn’t hurt that it smells like Christmas…just another reason to love it! Here are a few ideas on how to use Thieves oil to support your family’s wellness this winter. Look at this bread! Can you guess what happened in this picture? Someone wanted us to see the awesomeness of Thieves oil. They placed one drop of Thieves on this piece of bread and placed it in a plastic bag. See the area that is clear? That is the area where the Thieves oil was placed. How cool is that? Just think. One drop of oil. Now just think about how that Thieves oil is going to fight for you inside your body. Enough said. Thieves up, my friends. The cool people are thievesing. Yes, it is a word. Are you a thieveser? Because Thieves is the best oil ever, Young Living has created an entire line of products around it! What is the best wellness tip I have for you this winter? Thieves. Thieves everywhere. Thieves all the time. To do this, I would like to introduce you to the Thieves line. There is Thieves goodness in every product. Thieves toothpaste, mouthwash, and floss will combat the “ickies” in your mouth-one of the dirtiest places in your body-every day! Thieves hand soap and hand purifier will address the lovely “friends” that you acquire on your hands. And, Young Living gave us Thieves household cleaning products to scrub the little “darlings” out of our home! Note: If you want to try several of these Thieves products, then the cheapest way to do it is to purchase a Thieves kit! You will save money by grouping them together vs. buying them separately! The Thieves Premium Starter Kit ($160) is item #5466 and the Thieves Essential Rewards Kit ($115) is item #3697. The PSK can only be ordered on a quick order and the ER kit can only be ordered on ER. Coughing. Blah. Everyone hates it. Let’s make it go away. Thieves cough drops are your answer! These little drops of goodness are great for sore throats, relieving coughs, and cooling the nasal passages. The active ingredient in them is menthol, but they are also infused with these immune-supporting essential oils: cinnamon, clove, eucalyptus radiata, lemon, peppermint, and rosemary. They have a sweet, spicy flavor that will be the most pleasant experience in your moment of illness. Tummies. Upset bellies are the worst. How can you be prepared to combat them? My two favorite oils for supporting the digestive system are DiGize and Peppermint. We never run out of these two products! DiGize is not the most pleasant smelling oil, but it works great! Whenever I feel like we need extra digestive support, I lather it onto everyone’s feet and bellies. If they complain about the smell, then I will top it with a layer of peppermint because it is helpful for stomachs as well! Diffusing peppermint is a great option, also! Another helpful oil for this area is AromaEase. Have you ever tried it? Note: Peppermint should not be used on children under the age of two years old. Tip: Digest+Cleanse is a liquid softgel that is filled with similar oils as DiGize. Many people prefer this product to filling their own capsules. During the winter, our respiratory system needs extra support! My favorites are Breathe Again, RC, and Raven. Breathe Again is very convenient because it is a roll-on! We have one stashed in all kinds of places-in the car, at the kids’ school, in backpacks, and in my purse. I can grab it and swipe it on our chest whenever we feel like we need lung support. For diffusing, my favorites are RC and Raven. Both of these oils are respiratory powerhouses! I love them both, so I just switch between them in the diffuser! Each of them contain a different blend of respiratory oils. So, by switching it up, I feel like I am covering all of my bases! Any of these options many be applied to the feet as well. Make sure to cover your feet with thick socks after the application! These three oils are only a few of the ones that I love for the respiratory system. There are many others! But, I made myself choose three! (If I had to choose one more, then it would be Dorado Azul! See? I had to sneak one more oil in there! Dorado Azul is a Young Living EXCLUSIVE! We are the only company that has it! Did you know that Gary Young was the one who discovered and named the plant? While in Ecuador, Gary asked the natives what plants they used. They showed him this gem and he later learned that it was unknown to the botanical world. He named it Dorado Azul, which means Golden Blue, for the color of its leaves. Anyway……back to the oil……Dorado Azul smells pretty awful. I won’t lie. You won’t want to diffuse it! But, it works so great! Despite its odor, it is my favorite oil for the lungs! So, just go ahead and get it and cover it with a better smelling oil!) Oops. I guess I did tell you about a fourth oil! Well, it is great. You will thank me later….. In this photo, we have included a DIY recipe for a respiratory chest rub. You may use it on the chest or place it on the feet. Also, we have given you a few ways that we use the respiratory oils listed above. Your diffuser will be your best friend this winter! In fact, you will use it so much that I might encourage you to have a spare….and a spare for your spare! I love my diffuser because when we have “ickies,” we don’t always feel like being slathered in oils! With my diffuser, I can oil everyone with a pleasant oily mist. In fact, if I turn it on at night, then they probably won’t even know what hit them! As I mentioned earlier, roller ball blends are so easy to transport! Young Living carries several that are amazing, but did you know that you can create your own as well? When I am creating a “custom” roller ball blend, I go to an oily reference and I type in whatever I am trying to support. While looking at the recommendations, I add equal parts of every oil that I own until the roller bottle is half full. Then I fill the other half of the bottle with carrier oil and pop the roller ball on top. Don’t worry about the recommended oils that you don’t own. Just add the ones that you have! If you aren’t sure which oily reference to consult, then ask an oily friend where they would go to look. There are oily apps, oily books, and oily websites! You will have plenty of options. Ningxia Red is a crucial component to your winter wellness preparations! Ningxia is a blend of several “superfruit” juices such as wolfberry, blueberry, aronia, cherry, pomegranate, and plum. Also, it is infused with orange, yuzu, lemon, and tangerine oil. All of these oils are rich in d-limonene which is a powerful wellness-supporting constituent. (This is fancy language for…..you WANT d-limonene. Google it to see why!) When you combine superfruits with rockin’ essential oils, you get a juice drink that prevents oxidative stress, provides energy, and supports your immune system! Also, it is packed with Vitamin C and antioxidants! Now that you know the contents of Ningxia Red and why you should drink it, you will be happy to know that it TASTES GREAT! What? It is healthy and it tastes great? You heard me right, my friends. Grab some Ningxia. You can drink it on its own or add it to smoothies or slushies. 1 ounce a day is all that it takes. What does Ningixia Red and Immupro have in common? Both of them contain wolfberry! In addition to this superfruit, these chewable tablets contain reishi mushroom powder, also. Both of these ingredients provide powerful anti-oxidant support to your body! Resihi mushrooms have been used in Chinese medicine for over 2000 years! Also, this supplement contains melatonin which encourages a restful night’s sleep. Immupro is chewable, wolfberry fruit-flavored tablets. They provide a good night’s sleep AND immune support? I am in. Who is with me? Note: because this product contains melatonin, which is a natural sleep aid, you need to take it at night. Okay. You aren’t going to want to hear what I have to say next. But, it is probably the MOST IMPORTANT thing I will tell you in this entire class. Will you stay with me, friend? Please? We are going to talk about your colon. Pleasant topic, I know. Did you know that 70-80% of your immune system is in the digestive tract? In order to combat illness, our colon must be in top condition. In the book, Inner Transformations using Essential Oils by Dr. LeAnne Deardeuff, the doctor recommends using the Cleansing Trio by Young Living to clean up the colon. By cleaning our digestive tract, we are supporting our immune system. If you are interested in the full details on how Dr. Deardeuff recommends cleansing the colon, then I highly recommend you purchase her book on Amazon or Life Science Publishers. (Purchase the second edition, not the first.) The idea is really quite simple. Cleanse the colon so that your immune system can have a fighting chance. Note: The Cleansing Trio is a very gentle cleanse. Many of us have done it before! For most of us, life continued as normal! We didn’t feel the need to stay close to a bathroom! Of course, every person responds differently, but that has been the experience of many of us! Vitamin C is not new to the “winter wellness” scene. My mama has been pumping me with orange juice since I was big enough to hold a cup! But, what my mama didn’t know is that the sugar content in OJ is very high! Many kids have had MANY cavities due to the amount of juice that their parents have allowed in their diet. There is a better way! Super C! There are two types of Super C: one is a tablet and one is a chewable. Both will fill your body will Vitamin C. Did you know that our bodies cannot manufacture Vitamin C? For this reason, we should be consuming this important vitamin daily in order to support our immune function and promote our overall wellness. If you are trying to reinforce your immunity, you should take 2 tablets a day. If you are simply in maintenance mode, then you can do 1 tablet a day. Inner Defense is probably one of my newfound FAVORITES! What is it? It is simply several wellness oils crammed into an easy-to-swallow, liquid softgel completely ready for me to swallow. Yes, it should be easy for me to fill my own capsule of immune-boosting oils. But, when I am really busy, I never seem to take the time to do it! For this reason, I love Inner Defense. This little capsule is filled with the Thieves blend, oregano, thyme, and lemongrass. I pop one whenever I am feeling like I need extra immune support. In order to get the best results, you should pair it with Life 9! In the morning, swallow an Inner Defense. At night, take a Life 9. 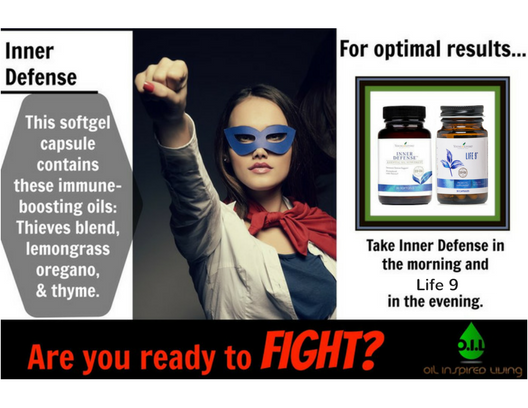 The Inner Defense helps combat the daily “ickies,” while the Life 9 puts beneficial bacteria into your gut that will help fight the battle! Life 9 and Inner Defense are partners. Life 9 is a powerhouse probiotic with 16.5 billion active cultures to support your digestion, immune system, and intestinal health! Thank you for joining us for our winter wellness class! I hope that you will leave here feeling EMPOWERED to enjoy your winter wonderland with a healthy body, a strong immune system, a cup of hot tea, and a warm cozy fire.